On December 1, Sting will perform at the Arena in Taipei, Taiwan as part of his celebrated Back to Bass tour! Performing his greatest hits, stripped down, he'll be joined by a 5-piece band including longtime guitarist Dominic Miller, Vinnie Colaiuta (drums), David Sancious (keyboards), Peter Tickell (electric fiddle) and Jo Lawry (vocals). Tickets will go on sale beginning Sunday, September 16 at 12NOON (local time). How can I get backstage passes? It would mean the world to me if I could actually meet Sting in person. Sorry, but there is no club presale for this show. Don't we have pre-sale for fan club members? 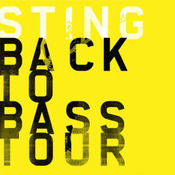 Two concerts in Russia are now confirmed for Sting's upcoming Back to Bass tour! On November 23, he will perform at the Basket Hall in Krasnodar and on November 24, at the Palace of Sport in Rostov-on-Don, joined by a 5-piece band featuring Dominic Miller (guitar), Vinnie Colaiuta (drums), David Sancious (keyboard), Peter Tickell (electric fiddle), and Jo Lawry (vocals). Tickets will be available beginning Monday, September 10 at 10AM (local time). Stay tuned to Sting.com over the coming days, as additional cities will be announced soon!